Thursday evening journeys in summer months diverted at Wembley to Stadium. AC gained a Sunday allocation. Sunday AC allocation increased and changed from RT to RTW. Sunday only (AC) allocation replaced by new Middle Row (X) RTW allocation. Additional Route Mon-Sat Wembley Pool - Edgware Station. Extended from Wembley to London Bridge at all times replacing Route 18B and trolleybus 662. Daily SE and X RM allocation introduced and Saturday ON withdrawn. AC converted from RTW to RTL and ON allocation converted from RT to RM. AC & X allocations withdrawn. Sunday Route extended from Paddington Green to Baker Street Station. Mon-Fri Alperton (ON) allocation withdrawn. SE garage closed - allocation transferred to Westbourne Park Garage. Saturday withdrawn between Kings Cross and London Bridge. 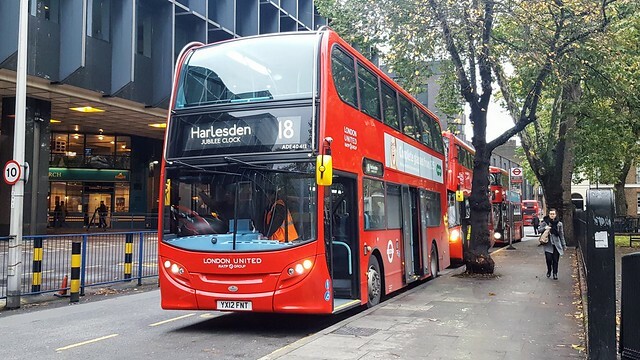 Withdrawn between Farringdon Street & London Bridge - replaced by new 17. .
Sunday afternoons extended from Baker Street to Euston Station. Monday-Saturday ON allocation replaced by increased X allocation. Withdrawn between Kings Cross & Farringdon Street..
Sunday withdrawn between Baker Street and Euston . Mon-Fri evenings withdrawn between Baker Street and Kings Cross. Mon-Fri withdrawn between Euston & Kings Cross but extended Sat & Sun from Baker Street to Euston. Converted from Metrobus to low floor double deck operation. Protect your garage and your home from flooding with LeafFilter.